ARBOGAST, an anchorite in Alsace who had a reputation for holiness. King St. Dagobert II (23rd December) appointed St. Arbogast to the Bishopric of Strasbourg circa 630. Though he would have preferred to have remained in his cave, St. Arbogast, was beloved by his flock, who venerated him even before his repose. Amongst the miracles attributed to St. Arbogast was still alive is bringing King St. Dagobert’s son back to live after he was killed in a hunting accident. St. Arbogast reposed circa 678, and at his own request was buried in the part of the cemetery set apart for the burial of criminals. A church was soon built over his tomb. 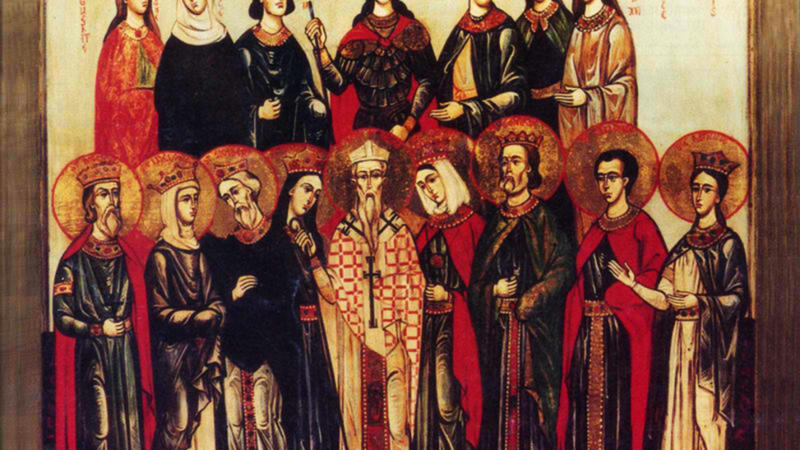 CLAUDIUS, JUSTUS, JUCUNDINUS, and COMPANIONS, a group of at least eight, and possibly as many as twenty-three, martyrs who suffered with St. Julia (vide infra) in Troyes. All were beheaded for their faith in Christ in 273. Their relics were enshrined in the Abbey of Notre-Dame de Jouarre near Meaux. CONSTANTINE, a disciple of St. Benedict (11th July) at Monte Cassino. St. Constantine became Abbot of Monte Cassino upon the repose of St. Benedict in 547. There is no further information on his life. St. Constantine reposed circa 560. JOHN and BENIGNUS, twin brothers who were disciples of St. Hidulf (11th July) and monks at his Abbey at Moyenmoutier in the Vosges mountains of Lorraine. SS. John and Benignus reposed in 707. JULIA of TROYES, a Christian native of Troyes who was taken as a spoil of war by the army of Emperor Aurelian after his victory over Tetricus. St. Julia was then given to St. Claudius (vide supra), an officer of Aurelian’s army. St. Julia brought St. Claudius to Christ and he joined her in martyrdom not long after, circa 272. PRAXEDES, (Second Century) the daughter of the Roman senator St. Pudens (19th May) and sister of St. Pudentiana (19th May). She is said to have been a zealous follower of Christ, and to have given her wealth to the care of the poor. The Basilica of Saint Praxedes ( Basilica di Santa Prassede all’Esquillino / Santa Prassede) in Rome is named after her. VICTOR, ALEXANDER, FELICIAN, and LONGINUS, Roman army officers in Marseilles were martyred there circa 290. WASTRADA, the mother of St. Gregory of Utrecht (25th August). Towards the end of her life she received monastic tonsure and spent the rest of her days at Susteren Abbey in present-day Echt-Susteren south-eastern Netherlands. St. Wastrada reposed circa 760, and was buried at Susteren Abbey.